Diabetic peripheral neuropathy (DPN), Vitamin B1, Acetyl cholinesterase, NF-κB. Diabetic Periphery Neuropathy (DPN) is one of the most common chronic complications of Diabetes Mellitus (DM), and the incidence rate is 50-90%. It is a major contributor to foot ulceration and lower limb amputation in persons with DM and have also a significant negative effect on patient’ s quality of life [1-4]. So far, there have been no clinical effective methods to prevent the initiation and progression of diabetic neuropathy. Foreign studies found that vitamin B1 insufficiency occurred in diabetic patients, but DPN would improve to some extent after vitamin B1 supplementation [5,6]. However, the specific mechanism of vitamin B1 for the treatment of DPN is not yet clear and this is worth further study. In this study, we detected the serum level of vitamin B1 in rats with DPN and quantitatively analysed the content of inflammatory factors and cholinesterase after vitamin B1 supplementation, as well as observed morphological changes of nerve tissues using transmission electron microscopy (TEM), aiming at exploring the effects of vitamin B1 intervention on DPN and the underlying mechanisms, which can provide theoretical basis for clinical prevention and effective treatment of DPN. The study was performed in male Sprague-Dawley rats (license NO. SCXK (Yu) 2010-0002), which were purchased in Feb 2015 from Experimental Animal Center in Henan, 6-8 weeks old and weighing 200-220 g. These rats were randomly divided into four groups (n=10/group): normal control (NC) group, diabetes mellitus (DM) group, diabetic peripheral neuropathy (DPN) group and vitamin B1 (VB1) group. In DM group, according to the previously literature, a rat model of diabetes was induced by intraperitoneal injection of 1% streptozotocin (STZ) in accordance with 55 mg/kg . After 72 h, blood sample was drawn from tail tip using needle and fasting blood glucose measured by glucometer was ≥ 16.7 mmol/L and these rats developed diabetes but no peripheral neuropathy after feed for 4 weeks. In DPN group, rats with diabetes were fed for 12 weeks, and changes in Motor Nerve Conduction Velocity (MNCV) were detected. When compared to rats with normal blood glucose, MNCV of sciatic nerve in diabetic rats decreased, and the difference was statistical significant, indicating the rat model of DPN was successfully developed. In VB1 group, after the model was established successfully, rats in this group with DPN received intramuscular injection of vitamin B1 with 10 mg/kg for each rat every day, intramuscular injection for 12 weeks. This study was performed in strict accordance with the recommendations in the Guide for the Care and Use of Laboratory Animals of the National Institutes of Health (Bethesda, MD, USA), Eighth Edition, 2010. The animal use protocol has been reviewed and approved by the Institutional Animal Care and Use Committee (IACUC) of Henan Provincial People’s Hospital. The rats were fixed in the supine position on the operating table, and the skin was cut open along the clavicle using a disposable scalpel, while the fascia and tendon tissues around common jugular vein were open with a small curved scissors; after about 1 cm common jugular vein was free using a glass dissecting tool, the blood sample was drawn using a disposable lancet along the distal end of the heart to make the blood flow into the tube slowly, and the angle of the needle direction and the blood vessel was 15°C. Next, above venous blood was allowed to stand at room temperature for 2 h, and was centrifuged for 10 min at 3000 r/ min; and the supernatant was collected. Vitamin B1 content was determined using LK3000V vitamin detector (Lanbiao electronic Tech, Tianjin, China) according to the manufacturer’s instructions, and the linear correlation coefficient (CR) was ≥ 0.995, while the repeatability (CV) was ≤ 10% for sample analysis. The sciatic tissues were accurately weighed, following addition of saline in line with the ratio of weight (g) to volume (ml)=1:9. Then these tissues were homogenated mechanically under the condition of icy water bathing, and centrifuged at 2500r/min for 10 min. Next the supernatant was collected for test. Acetyl cholinesterase (AChE) was determined using AChE detection kit (Jiancheng Bioengineering Institution, Nanjing, China) by spectrophotometry in strict accordance with the manufacturer’s instructions. The AChE activity was calculated according to the formula: AChE activity in tissue homogenate (U/mg pro)=(detection OD value-control OD value)/(standard OD value-blank OD value) × standard concentration (1 μmol/ml)/ sample protein concentration (mg pro/ml). The rats were sacrificed, and the sciatic nerve tissues were collected quickly. Above tissue sample was fixed with formaldehyde, dehydrated in ethanol with xylene as clearing medium. Then, the tissue was processed to paraffin and sectioned. Next, the mounted sections were deparaffinised, rehydrated, and stained with haematoxylin. After rinsed with water, the sections were performed for colour separation in 1% hydrochloric acid alcohol, stained with 1% eosin, then dehydrated with gradient alcohol. Meanwhile, xylene was used as clearing medium. Finally, the sections were mounted by neutral resin, observed under microscope and photographed. After the rats were sacrificed, the bilateral sciatic nerve from the lower limbs of the rats (1 cm from sciatic notch to distal end) was collected, fixed with 4% glutaraldehyde for 48 h, and then washed with phosphate buffer. Following ethanol dehydration and Epon embedding, the tissue was sectioned into the side of 1 mm × 1 mm × 1 mm for preparing TEM specimens. The ultrastructure was observed by transmission electron microscopy (JEM-1200EX, JEOL Ltd., Tokyo, Japan) after staining with lead citrate. The mounted sections were deparaffinised and rehydrated. Then they were placed in boiling citrate buffer (pH=6.0), which were treated with the mid-range microwave for 10 min. After cooled with natural running-water, the sections were fetched from the buffer, placed in 3% H2O2 solution to block endogenous catalase activity, following the soak in PBS. After addition of goat serum with 50 μl/piece, endogenous biotin in the tissues was blocked for 20 min at room temperature. Then the liquid on the surface was shaken off rather than washed off, the slices were incubated with primary antibody (rabbit polyclonal antibody, AB77851, Boster, Wuhan, China) with 50 μl/piece in 4°C refrigerator overnight. After soaked in PBS buffer, the slices were incubated with the secondary antibody (1:100; mouse monoclonal antibody, BM0104, Boster, Wuhan, China) with 50 μl/piece at 37°C to stand for 30 min. Then the slices were soaked with PBS again, and after addition of HRP enzyme-linked avid in, diaminobenzidine (DAB) was used as the chromogen. Next, the slices were stained with haematoxylin, dehydrated with gradient alcohol. Meanwhile, xylene was used as clearing medium. Finally, the sections were mounted by neutral resin, observed under microscope and photographed. And immunohistochemical analysis of the results was performed on Image-Pro Plus 6.0 image analysis software to measure NF-κB positive area (PA) and integral optical density (IOD) in each field for each rat. All data were performed using SPSS version 17.0 software (SPSS Inc, Chicago, IL, USA) and expressed as mean ± SD. Normality and homogeneity of variance analysis were applied for each set of data at first, and then non-paired sample t-test was carried out. P<0.05 was considered statistically significant. As shown in Table 1, compared with NC group, serum vitamin B1 content and acetyl cholinesterase level in sciatic nerve tissues in DM, DPN and VB1 group were decreased; moreover, vitamin B1 content in DM and DPN group was significantly decreased when compared with NC group (P<0.05), and the comparison of acetyl cholinesterase level between DPN group and NC group was statistically significant (P<0.05). Serum vitamin B1 content and acetyl cholinesterase level in VB1 group were significantly higher than those in DPN group, and the difference was statistically significant (P <0.05) (Table 1). Note: Compared with NC group, *P<0.01, &P<0.05; compared with DPN group, #P<0.05. Table 1. Serum vitamin B1 content and acetyl cholinesterase level in sciatic nerve tissue in each group (x? ± s). Nerve tissue consisted of neurons, glial cells and fibres, besides cytoplasm contained general cytoplasm organelles (mitochondria, Golgi apparatus, lysosomes, etc. ), as well as characteristic neurofibrillary and nissl body. Nevertheless, fine structure of nerve fibres was not observed by conventional HE staining of nervous tissues; furthermore, nerve fibres and myelin also did not distinguish, but the changes in the number of the nucleus could be noticed. HE staining can colour the chromatin in cell nucleus and ribosomes in the cytoplasm as hyacinthine, while the cytoplasm and the extracellular matrix components were colored as red. Then four slices from each experimental animal were randomly selected and placed under light microscope to record the number of nuclei, and the results were shown in Figure 1. Figure 1: HE staining of sciatic nerve tissues in rats (Magnification X 400). Note: Chromatin in the nucleus and ribosome in the cytoplasm were stained into purple-blue by HE staining, followed by observation of the number of nuclei with light microscope. Compared with NC (A), the numbers of neuronal nuclei in DM and DPN group (B and C) were reduced, and DPN group decreased significantly, and the difference was statistically significant, whereas the number of nuclei in VB1 group (D) was higher than that of DPN group. 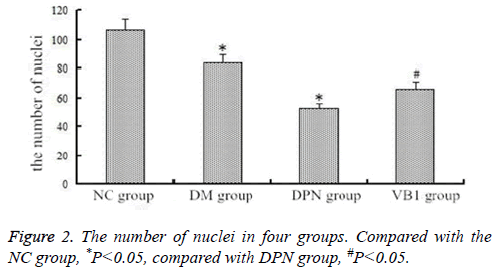 Compared with NC group (106.58 ± 6.37), the number of nerve nuclei both in DM group (83.56 ± 4.98) and DPN group (52.09 ± 8.63) reduced; Moreover, its number in DPN group significantly reduced, and the difference was statistically significant; while the nuclei number (66.02 ± 7.41) in VB1 group was increased when compared with DPN group (Figure 2). Figure 2: The number of nuclei in four groups. Compared with the NC group, *P<0.05, compared with DPN group, #P<0.05. Under electron microscope, we could observe that normal rats presented the even thickness of sciatic nerve myelin, compact and orderly lamellar structure in concentric circular arrangement, uniform electron density in the axon, and a lot of mitochondria, neurofilament and microtubule, as well as normal Schwann cells. In addition, rats with DPN presented uneven thickness of sciatic nerve myelin, partial lamellar separation in bent and twisted state, and some lamellar growth into axon to make the axon thin, as well as organelles degeneration, chromatin condensation, and incomplete nuclear envelope in Schwann cells. At 12th week after vitamin B1 supplementation, the uneven thickness of sciatic nerve myelin and lamellar separation ameliorated; Meanwhile, Schwann cells presented normal organelles basically and chromatin condensation (Figure 3). Figure 3: Ultra structural changes of sciatic nerve tissues in each group (Magnification X 8000). Note: Normal rats presented the even thickness of sciatic nerve myelin, compact and orderly lamellar structure in concentric circular arrangement, uniform electron density in the axon, and a lot of mitochondria, neurofilament and microtubule, as well as normal Schwann cells (A). Sciatic nerve structure of diabetic rats was normal (B). Rats with DPN presented uneven thickness of sciatic nerve myelin, partial lamellar separation in bent and twisted state, and some lamellar growth into axon to make the axon thin, as well as organelles degeneration, chromatin condensation, and incomplete nuclear envelope in Schwann cells (C). In VB1 group, the uneven thickness of sciatic nerve myelin and lamellar separation ameliorated; meanwhile, Schwann cells presented normal organelles basically and chromatin condensation (D). In rats, NF-κB was mainly expressed in the Schwann cells, axons and vascular endothelial cells in sciatic nerve, but less expression in myelin. Immunohistochemical staining showed that the nerve tissues were dyed brown, and the area with upregulation of NF-κB expression was stained more deeply. As shown in Figures 4 and 5, PA and IOD were significantly increased in DM group and DPN group when compared with NC group, and the difference was statistically significant (P<0.01). Moreover, when compared with DPN group, PA and IOD in VB1 group were reduced, and the difference was statistically significant (P <0.05) (Figures 4 and 5). Figure 4: Immunohistochemistry of NF-κB in sciatic never in each group (Magnification X 400). Note: Immunohistochemical staining showed that NF-κB was mainly expresses in Schwann cells, axons and vascular endothelial cells. Compared with NC group (A), the expression of NF-κB in DM group and DPN group was significantly increased, and the staining was enhanced (B and C). Compared with DPN group, NF-κB expression was decreased significantly in VB1 group (D), and the difference was statistically significant (P<0.05). Figure 5: The expression of NF-κB in four groups. NF-κB refers to nuclear transcription factor κB, PA is positive area, and IOD represents integrated optical density. Compared with the NC group, *P<0.01, compared with DPN group, #P<0.01. Neurological complications of diabetes are the most common complication, which has a serious impact on the prognosis of diabetic patients. Its onset can involve any part of the body from the central nerve to the neuromuscular junction, which bring a great challenge to the clinical diagnosis and treatment. Previous studies have reported that vitamin B1 insufficient exists in patients with diabetic peripheral neuropathy (DPN), especially vitamin B1 and B12 deficiency [8-10], but there has been few research on mechanisms involving the impact of vitamin B1 on DPN, and this study was carried out to investigate the changes in the vitamin B1 content in DPN patients, as well as the influence of exogenous vitamin B1 supplementation on DPN. In this study, rats were divided into normal control (NC) group, diabetes mellitus (DM) group, diabetic peripheral neuropathy (DPN) group and vitamin B1 (VB1) group. Then VB1 content was detected in each group, and the results showed that rats in DM and DPN group had a lack of vitamin B1 to some extent, and the level of serum vitamin B1 increased after exogenous vitamin B1 supplementation. AChE content in normal nerve tissues is higher. AChE mainly comes from motor neuron cell bodies, and it can arrive fast at the nerve terminal part along axon. Moreover, AChE activity reflects endplate degeneration and regeneration as well as the functional status of motor neurons [11,12]. In this study, we observed that AChE level in sciatic nerve tissues decreased in DM and DPN group, besides HE staining showed that the number of rats with diabetic neuropathy DPN group DM and the number of neuronal cell nucleus in both DM and DPN group was reduced, and this kind of decrease in DNP group was significant. In addition, electron microscope showed that rats with DPN presented uneven thickness of sciatic nerve myelin, partial lamellar separation in bent and twisted state, and some lamellar growth into axon to make the axon thin, as well as organelles degeneration, chromatin condensation, incomplete nuclear envelope in Schwann cells, which illuminate the ultrastructure of sciatic nerve cell damaged, suggesting that DPN had adverse effects on the motor system. However, after vitamin B1 supplementation, the level of AChE was increased, and the uneven thickness of sciatic nerve myelin and lamellar separation ameliorated; meanwhile, Schwann cells presented normal organelles basically and chromatin condensation, which unfolded the number of nerve cells in diabetic rats was increased after vitamin B1 supplementation, indicating that cell damage improved significantly, and motor neurons and peripheral motor nerve function restored. The onset of DPN is the result of many factors, such as, abnormal activation of oxidative stress and signal transduction pathway, which can lead to the initiation and progression of DPN. Oxidative stress refers to the imbalance between the generation of active oxygen products and antioxidant defence system, thus leading to tissue damage . Some studies have shown that oxidative stress-sensitive NF-κB activation plays an important role in the pathogenesis of diabetic microangiopathy. Furthermore, NF-κB synthesis can increase by combining with vascular cell adhesion molecule 1 and endothelin promoter, resulting in vasoconstriction and the formation of thrombus. Meanwhile, NF-κB may promote the release of insulin-like growth factor-IA and platelet-derived growth factor, and these factors can cause cell matrix proliferation, vessel hypertrophy, lumen stenosis and decreased blood vessel elasticity [14,15]. And all above facts are closely related to the occurrence of diabetic microangiopathy including neurological diseases. In this study, immunohistochemistry assays were used to detect the changes in NF-κB level in sciatic nerve tissues, and the results showed that NF-κB expression in DPN group was significantly increased, while its expression was decreased significantly after vitamin B1 supplementation, thereby improving diabetic peripheral neuropathy. Vitamin B1, also known as thiamine, is composed of thiazole ring and the pyrimidine ring, and an alkaline environment can accelerate the decomposition, while an acidic environment can keep it relatively stable, participating in glucose metabolism as coenzyme [16-18]. From the point of view of metabolic substance analysis, vitamin B1 deficiency can affect oxidative decarboxylation of pyruvate, so pyruvate cannot enter the citric acid cycle, which contributes to block glucose oxidation, resulting in less energy supplying for nerve tissue. Meanwhile, vitamin B1 is necessary for the metabolism of branched chain amino acids (leucine, isoleucine). Vitamin B1 insufficient can block the oxidation process, which results in the accumulation of pyruvic and lactic acid, as well as the body’s ability to synthesize fat will decline. Besides lipids are the major component of cell membranes, if long-term lack of vitamin B1 exists, the body will not be able to maintain good integrity of myelin nerve tissue, thereby leading to the development of DPN [19-21]. The study shows that vitamin B1 has some preventive and improving effects on DPN, and this effect can be achieved by changing acetyl cholinesterase content in sciatic nerve tissues and NF-κB expression. Therefore, as for those suspected DPN patients, vitamin B1 supplementation not only ensures the body’s normal metabolism, but also replenishes vitamin B1 promptly for patients with early hidden deficiency. We thank all participating investigators in this study. Ruipeng Song and Zhigang Zhao conceived of the study and drafted the manuscript. Ruipeng Song and Xuehui Chen participated in the study design and coordination. Xuehui Chen helped to conceptualize the study, conducted the statistical analysis, and helped to draft the manuscript. All authors contributed to critical revision of and approved the final manuscript. Sobhani S, Asayesh H, Sharifi F, Djalalinia S, Baradaran HR, Arzaghi SM, Mansourian M, Rezapoor A, Ansari H, Masoud MP, Qorbani M. Prevalence of diabetic peripheral neuropathy in Iran: a systematic review and meta-analysis. J Diabetes Metab Disord 2014; 13: 97. Tan XM, Fan WC, Wang HW, Guo HY. Effects of α-lipoic acid combined with mecobalamin for the treatment of diabetic peripheral neuropathy. Chinese J Pract Nerv Dis 2015; 22: 89-90. Yang DH. Effective analysis of lipoic acid injection in the treatment of painful diabetic neuropathy: 90 cases. Diabetes New World 2015; 17: 21-22. Li YJ, Feng YJ, Zha YF. Value of 10 g monofilament for screening of diabetic peripheral neuropathy. J Hebei Med Univ 2015; 36: 884-886. Page GL, Laight D, Cummings MH. Thiamine deficiency in diabetes mellitus and the impact of thiamine replacement on glucose metabolism and vascular disease. Int J Clin Pract 2011; 65: 684-690. Qiao Q, Zhao ZG. Effects of Vitamin B1 and its derivatives on diabetic neuropathy. Chinese J Diabetes Mellitus 2016; 8: 244-246. Han J, Yu JD, Yao Q, Huang LM, Wang W. Influence of huoxuejiedu formula on AGEs-RAGE-NF-κB pathway in sciatic nerve of diabetic rats. Lishizhen Med Materia Medica Res 2012; 23: 2151-2153. Larkin JR, Zhang F, Godfrey L, Molostvov G, Zehnder D, Rabbani N, Thornalley PJ. Glucose-induced down regulation of thiamine transporters in the kidney proximal tubular epithelium produces thiamine insufficiency in diabetes. PLoS One 2012; 7: e53175. Pacal L, Tomandl J, Svojanovsky J, Krusova D, Stepankova S, Rehorova J, Olsovsky J, Belobradkova J, Tanhauserova V, Tomandlova M, Muzik J, Kankova K. Role of thiamine status and genetic variability in transketolase and other pentose phosphate cycle enzymes in the progression of diabetic nephropathy. Nephrol Dial Transplant 2011; 26: 1229-1236. Brownlee M. Biochemistry and molecular cell biology of diabetic complications. Nature 2001; 414: 813-820. Zhang JJ, Zhang HJ. Associations between serum cholinesterase and complications of type-2 diabetes. Henan Med Res 2014; 23: 103-104. Wang J, Li QF, Cheng QF. Associations between the serum cholinesterase and complications of type-2 diabetes. Chin J Diabetes 2012; 20: 48-50. Zhang M, Zhang LH. Influence of advanced glycation end products on the function of Schwann cells in vitro and related mechanism. Chinese Gen Pract 2013; 16: 1729-1732. Jiao Y, Yu Y, Li B, Yu YH. Protective effect of hydrogen on diabetic peripheral neuropathy by suppressing nulcear factor-kappaB pathway. Chin J Contemp Neurol Neurosurg 2013; 13: 772-777. Karachalias N, Babaei-JR, Rabbani N, Thornalley PJ. Increased protein damage in renal glomeruli, retina, nerve, plasma and urine and its prevention by thiamine and benfotiamine therapy in a rat model of diabetes. Diabetol 2010; 53: 1506-1516. Hosseinzadeh R, Khorsandi K. Interaction of vitamin B1 with bovine serum albumin investigation using vitamin B1-selective electrode: potentiometric and molecular modelling study. J Biomol Struct Dyn 2016; 34: 1903-1910. Gibson GE, Hirsch JA, Fonzetti P, Jordan BD, Cirio RT, Elder J. Vitamin B1 (thiamine) and dementia. Ann N Y Acad Sci 2016; 1367: 21-30. Gonzalez-OM, Martinez-Abundis E, Robles-CJA, Ramirez-RV, Ramos-ZMG. Effect of thiamine administration on metabolic profile, cytokines and inflammatory markers in drug-naïve patients with type 2 diabetes. Eur J Nutr 2011; 50: 145-149. Du X, Edelstein D, Brownlee M. Oral benfotiamine plus alpha-lipoic acid normalises complication-causing pathways in type 1 diabetes. Diabetol 2008; 51: 1930-1932. Fraser DA, Diep LM, Hovden IA, Nilsen KB, Sveen KA, Seljeflot I, Hanssen KF. The effects of long-term oral benfotiamine supplementation on peripheral nerve function and inflammatory markers in patients with type-1 diabetes: a 24 month, double-blind, randomized, placebo-controlled trial. Diabetes Care 2012; 35: 1095-1097.